We just wrapped up our last wedding of 2018, so I thought it would be fun to go back and recap some of my wedding guest looks for this year and give some of my go-to tips for weddin' guestin'. It seems to just be the stage of life we are in right now, so 80% of the time when I’m dressing up, it’s for a wedding or wedding related event. We've had some dear friends get married this year - it has been so fun! In this post, we’re recapping 2018 Spring/Summer wedding guest fashion moments + rounding up similar v i b e s for 2018 Fall/Winter events. Our friends + family (the groom is Joel's cousin!) got married in LA in March. I get starry eyes when I think about California, so I knew I'd be excited about packing outfits for this trip. California always feels effortlessly laid-back but glamorous. To the wedding, I wore this highlighter yellow mini dress, balanced with long sleeves. It was a fun statement outfit without being too much. 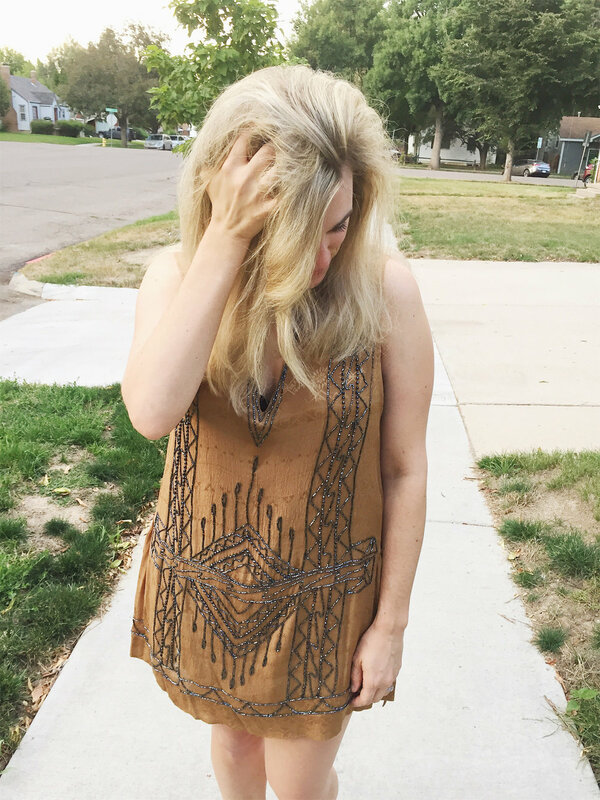 I bought it from Chic Wish a few years ago (If you've never shopped at Chic Wish - give it a shot!) and have already worn it to two weddings in 2017 as well! (DON'T FEAR THE WEDDING GUEST RE-WEAR!). While it's no longer available, I've linked up some fab current yellow options below. Check them out! I work in the event industry for my full-time job, but I seldom share it on H+H. This might change one day, but for now, it’s narrowed into my other passions! However, this wedding is different than the rest, as it was one I planned with + for a friend outside of my job. Pro Tips: for planners, photographers, anyone of their feet all day that don’t have a uniform - comfy, stylish shoes, hands-free phone holder, layers, stretchy pants with pockets, blend-in. As I mentioned above, though I love good, fresh fashion moment, I am not above a wedding guest re-wear. 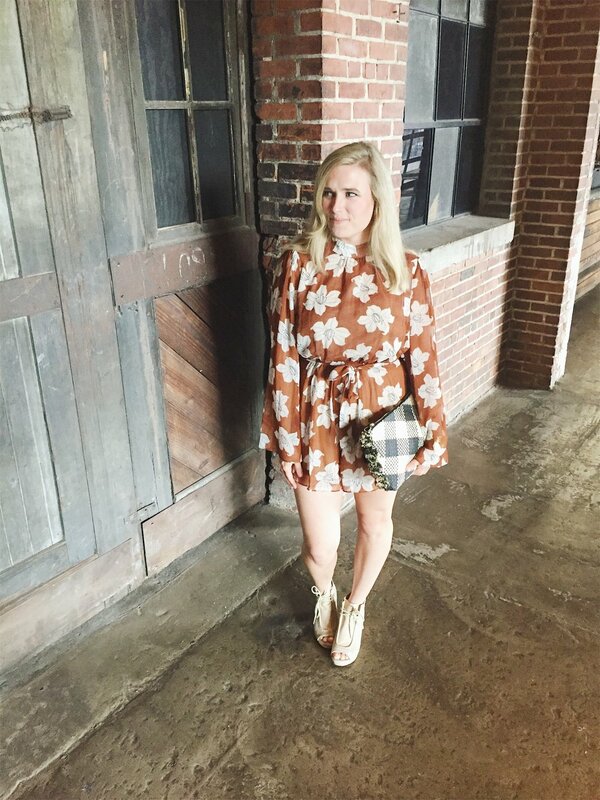 I wore this dress to a rehearsal dinner last December in Alabama as to a rehearsal dinner in Los Angeles this past March. This dress is just perfect for making a moment (sequins + volume + length), without being too over the top. I felt so fabulous at this wedding as a guest, even though it was my 3rd wear! I did change my shoes each time, based on season and dressiness factor. Scared of a re-wear? Try it first on events in separate parts of the country - I can promise you 99.9% of people will have no idea! Going along with my 1 star review theme - insert this romper. 3 stars: too cheap, not worth it, etc., etc. But it’s on clearance now for $40 (but honestly - full price it’s $58 - not bad), so to me, it’s totally worth the price. It’s fully lined, true to size, and just funky and different. I give it 4 stars - it’s fun, affordable, good quality - however, it’s held up by a tie around the neck, as well as a tie around the waist. 1 star lost of ease of wear throughout the night (think: BATHROOM). Regardless, I luuuuurve it. 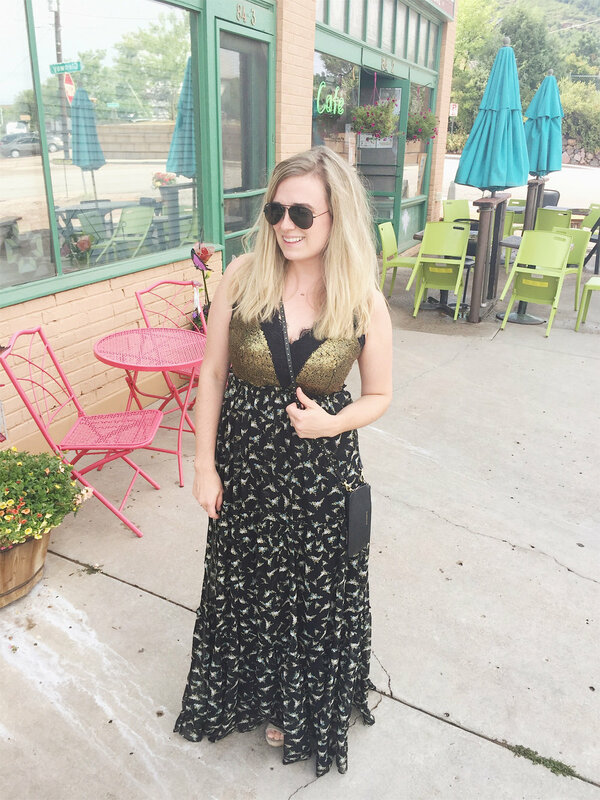 Buy it here, and check out my jumpsuits picks above in this post under our 'Longmont, CO' wedding! Wear a lip stain or long-lasting lip! There are fewer things more annoying while wedding guesting than having to 'freshen up.' My top choice is Cover Girl's Jumbo Gloss Balm-Creams. I've been a fan for years, and it's stayed consistent. Stays on FOREVER. Wear a 'quiet' outfit...literally, one that doesn't make noise. Weird? But seriously, I have more than one jingle-worthy necklace and a couple of pairs of shoes that are the same. This could even stretch to wearing a pair of loud heels or shoes on an acoustic church floor. Think about it before heading out of the house! Send your gift beforehand. While some weddings are local, a lot of our are not since we live away from our families and hometowns. It has been the best thing to send our gifts beforehand (or soon thereafter), so we don't travel with them, and honestly, a lot of times it makes it easier for the couple as well! PLAN TO BE EARLY! Traffic is different everywhere - never expect it to be consistent. Always plan to be around a half hour early to give yourself extra time. Less stress, more fun guesting! Turn your phone on Low Battery + Do Not Disturb mode. This has been the best tip of my life in the event world. Low battery = your phone stops automatically pulling excess data, i.e. mail, app notifications, etc. and allows your phone to hold battery SO. MUCH. LONGER. I've gotten to the point where I have it on this mode almost all the time now! Also, Do Not Disturb is helpful, so nothing comes through and makes noise during the ceremony! What are your go-to Wedding Guest looks? Tell me!